Rambo Grand Prix Competition Sheet is made of double bonded waterproof and anti pilling fleece. The outer fabric consists of the double-bonded fleece and the inner lining consists of a waterproof layer. The model of the blanket ensures that the rider legs can work effectively. 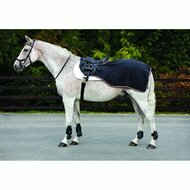 The blanket can be attached to the withers by means of Velcro and at the back with a leg strap. Fine material and is great on the horse. Fits just around an 18.5 "saddle. The blanket is the description, the cut fits very well and it is nice and light! I would order it again anytime! A nice light riding blanket. My Iberian horse now likes riding in the rain or when it's snowing! I imagined the blanket thicker. Since I wanted to use them for riding in the winter, I sent them back. The quality is otherwise expected to be great!